Mylan NV's EpiPen has made headlines recently, and not in a positive way. Outrage grew in August at a jaw dropping 500% price hike for its EpiPen epinephrine auto injectors. The EpiPen is a lifesaving device used to treat severe allergic reactions, or anaphylaxis. The device is essentially a spring loaded syringe that injects a dose of epinephrine into the thigh, even through clothing. When Mylan acquired EpiPen in 2007, a two-pack cost about $124. Prices have jumped almost 500% to the current $608 price tag. Questions surrounding anti-competitive practices, unjust enrichment and Medicaid fraud have led to government hearings and investigations. Mylan controls about 90% of the market share for epinephrine devices. Its only competition, Amedra Pharmaceutical's Adrenaclick, was approved in 2003 and costs just $124. However, the Adrenaclick is not covered by many insurers and is not a generic for EpiPen, so it cannot be substituted if a provider writes a prescription for EpiPen. Another device, Auvi-Q entered the market in 2013 but was voluntarily recalled by the manufacturer, Sanofi-Aventis, just two years later citing device malfunctions. There is currently no generic for EpiPen, although Mylan has promised to make a branded generic for a half the price - $300 for a two-pack. A proposed generic by Teva Pharmaceutical was rejected by the FDA in March of 2016 following a lobbying campaign by Mylan. Questions surround the Teva Pharmaceutical generic, and whether Mylan engaged in an illegal pay for delay arrangement. Just last week, Mylan paid the U.S. government $465 million to settle claims that it overcharged Medicaid. 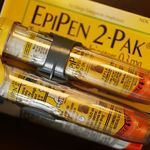 Mylan had classified the EpiPen as a generic rather than a branded product, giving the government much lower rebates than should have been given. This meant Mylan was providing the government with a 13% rebate, when classification as a brand name drug would have provided a 23.1% rebate. Federal spending on the EpiPen totaled nearly $1.3 billion from 2011 to 2015. Mylan's unfair business practices have hurt patients, insurers, and the government. The False Claims Act may offer some recourse through whistleblower and government suits. The author wishes to acknowledge the research work of Megan Nash, a Healthcare Fraud Research Assistant at Cotchett, Pitre & McCarthy.